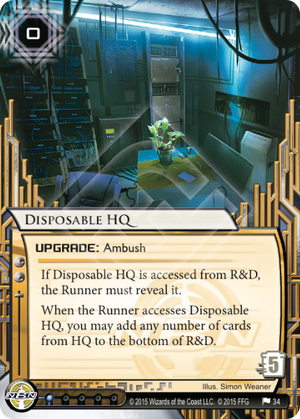 In what order are the cards added to the bottom of R&D with Disposable HQ? Does Disposable HQ trigger from Archives? Yes, "when accessed" abilities trigger from any server, whether or not the card is active, unless the ability specifically says otherwise. The obvious use of this is to dump agendas from a flood. They will be incredibly safe in most cases. Perhaps put this on your scoring server, or an econ server, or R&D, whatever. Somewhere they have to run. Then they have to choose whether to pay the insane 5 trash cost, or have it trigger every time they run that server. Or, they might just access it naturally in R&D, HQ or even Archives. Perhaps you fake-out a dump of agendas, and stack it with lots of face-down non-agenda cards, including this, then tuck the agendas that are in your hand when they run archives. Or put it on HQ, so when they run to steal agendas from hand, they only get to access once before you tuck the rest. A problem that deck often encounters is having certain cards in hand when it wants them in archives, to put back into the deck in a particular way with Jackson Howard after Power Shutdown. Normally, you overdraw, then toss them in archives, or play Reuse. But Disposable HQ doesn't just throw them in archives. It lets you reliably stack the bottom of the deck exactly how you want it. Instead of trashing your entire deck with Power Shutdown, you trash all the way down to the cards you put on the bottom, in your chosen order. (Be sure to remember how many you put down there!) Then you Accelerated Diagnostics for the top 3. Oh, look at that, the cards are exactly how you wanted them! This card can help you combo off faster against an aggressive runner. All that, for a 1 influence upgrade with a trash cost of 5, that you hardly even care if they even trash it. Does it fit in every deck? No. But it's absolutely useful in the right situation.